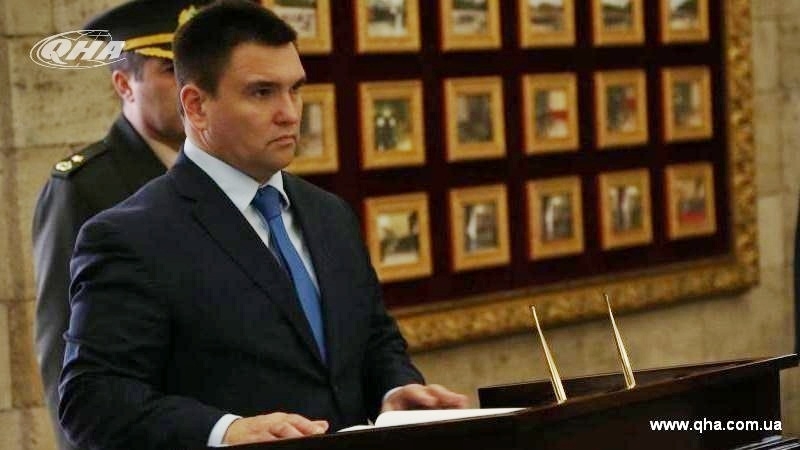 At a joint press conference with his Turkish counterpart Mevlüt Çavuşoğlu Ukrainian Foreign Minister Pavlo Klimkin thanked the Turkish authorities for supporting Ukraine's territorial integrity, the Ukrainian Foreign Ministry reported on Twitter. According to Klimkin, the press conference was devoted to bilateral relations between Kyiv and Ankara. "We are grateful for the consistent support of Turkey with regard to the occupied Crimea and Donbas," Minister Klimkin said. Earlier, the Head of the Ukrainian Foreign Ministry at a meeting with his Turkish counterpart in Ankara said that Ukraine and Turkey are planning to reach the trade turnover level of $ 10 billion. According to the Head of the foreign policy department of Ukraine, reaching thus point and the conclusion of the agreement on the Free Trade Area will be one of the main achievements of bilateral relations and economic cooperation. Earlier it was reported that Klimkin laid flowers near the building of the Grand National Assembly of Turkey, which in July 2016 was bombed during an attempted coup. The Head of the Ministry of Foreign Affairs was accompanied by the leader of the Crimean Tatar people, the Presidential Commissioner of Ukraine for Crimean Tatar People Affairs, People's Deputy Mustafa Dzhemilev, the Ambassador of Ukraine to Turkey Andrii Sybiha and others. Today is the second day of the working visit of Ukrainian Foreign Minister Pavlo Klimkin to Turkey.